This title was first published in 2003. Based on a blend of knowledge and perspectives from a variety of disciplines this volume examines the human-environment interaction in Africa, with a focus on the economic, social and political processes that generate environmental change and problems in this region. Currently there are controversies over and challenges to such concepts and issues as environment-human relationships, ecological resilience, decertification, sustainable development, globalization and North-South dialogue. This book draws upon past and present research findings to discuss these issues. It features: an examination of the characteristics, processes and patterns of environmental crises; an analysis of the principal issues and challenges facing policy makers and implementers; and the promotion of awareness of theoretical, empirical and comparative research. The volume not only seeks to answer some of the old questions, but also open up new ones for further discussion. 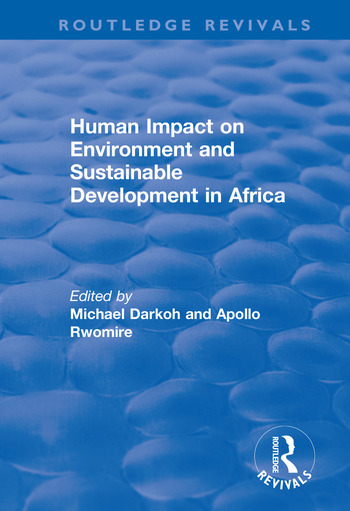 Contents: Introduction: ideas on human impact on environment and prospects for a sustainable future in Africa, M.B.K. Darkoh and A. Rwomire; A socio-economic analysis of environmental degradation in Africa, R.N. Ogbudinkpa; Political and social dimensions of environmental crisis in Nigeria, C. Obi; Environmental security in the drylands of Africa: the role of science and technology, M.B.K. Darkoh; Environmental security in South Africa: a prognosis for regional security, J.K. Van Wyk; Population-environment interface in Botswana: issues, challenges and prospects, G. Letamo and O. Totolo; Environment and forced migration: a review, W.F.G. Cardy; International migration in Southern Africa: a retrospective benefit-cost analysis, A. Rwomire; Desertification: myths and realities, O.B. Smith and S. Koala; The nature, causes and consequences of desertification in the drylands of Africa, M.B.K. Darkoh; The Sahel dust bowl: processes and control strategies, O.B. Smith and S. Koala; Agriculture and biodiversity in the drylands of Africa, M.B.K. Darkoh; Indigenous systems of land evaluation: some examples from Eastern and Southern Africa, H.M. Mushala; The livestock industry and the subsistence economy of rangelands in Africa with special reference to Botswana, B.T. Kgabung; Globalization and wildlife resource sustainability in Botswana, J.E. Mbaiwa, M.B.K. Darkoh and J. Nakizito; Community-based tourism in Ngamiland district, Botswana: development, impacts and challenges, J.E. Mbaiwa; Urban poverty and environmental health: the case of Kampala City, Uganda, A. Nuwagaba; Government policy and environmental waste management in Maiduguri urban area, Nigeria, S.O. Okafar; Adaptive strategies of small fishermen to environmental degradation induced by oil pollution in the Niger Delta: implications for rural planning, A. Avwunudiogba; Context, principles and practices of conservation strategies and environmental action plans, M.A. Mohamed Salih; Sustainable human development and the North-South dialogue, J.B. Opschoor; Index.